This is a guest piece sent to me by my reader one of my readers. This very successful series is filmed in Port Isaac, a village I know well. Of course, none of the main actors are Cornish. Nonetheless, when the series started, we locals were some excited at the possibility of being employed as extras and appearing on TV. This soon wore off however. Here’s why – a story that will show you how the programme’s producers set out to portray the natives. 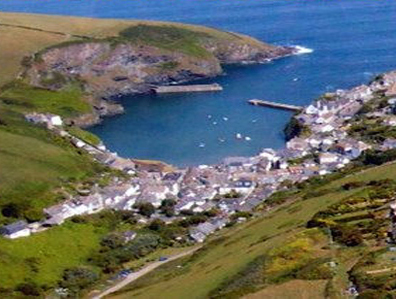 What’s Port Isaac done to deserve 67% 2nd and holiday homes in the old village, 39% up on the hill AND Doc Martin? Sure enough, we learnt that extras were needed for the production, so we had the chance to appear in the series and earn some money too. I was duly telephoned one day and asked to appear on set. I was told that I’d be a patient in Doc. Martin’s surgery. As to costume … ‘Raid your gran’s wardrobe’, I was told. ‘No bright colours, no patterns, nothing modern. Have you got an old shopping bag? And old flat shoes’. I assumed that the series must be set in the 1950s. I dug out my oldest clothes and went down to the church hall – filming HQ. ‘No make-up’. I wiped it off. Sitting on set, I looked around me. The series was obviously set in the present day. But my fellow ‘patients’ and I were looking like refugees from ‘Dad’s Army.’ Turned out the ‘locals’ were peasants, with no dress sense, no style or personality. I was amused when it first aired but went off it. Now it seems to make fun of the “outsiders” who come into the village with their city ways. The locals definitely seem unimpressed.